Detail of all the National and State Parks located along Route 66: Full information on each of the Protected Natural Areas located along the alignment of Route 66. A State by State list of both State and National Parks. Places where you can hike, fish, hunt, watch the wildlife and enjoy the outdoors. If you are planning to visit several National Parks over the course of one full year, you should consider buying the Annual Pass: It costs $80 you can buy it at most parks or online, from the USGS store (http://store.usgs.gov/pass). It admits pass owner⁄s (up to 2 persons can own a single pass) and the passengers in a non-comercial vehicle (for per-vehicle fee areas) or the pass owner + 3 adults at per-person fee areas. Note that photo identification will be requested to verify pass ownership. and that children under 16 are always admitted free. If you visit Yosemite ($30⁄car), Grand Canyon ($30⁄car) and Petrified Forest ($20⁄car) National Parks and you more than will cover the costs of your annual pass. US citizens or permanent residents aged 62 or older can get a lifetime Senior Pass for $10. US citizens or permanent residents with permanent disability can obtain a free Access Pass. 79 miles northwest of Flagstaff along US 180 (87 mi. via US 66 and NM 64). See a Map with directions and only 59 miles north of Williams along NM 64 and US 180 (Map with directions). Plan a full day trip to visit it. What to do in one day? We drove in through the South Entrance along AZ-64. We bought the Annual Pass for $80 (and saved a fortune because we used it at many parks on that trip: Zion, Bryce Canyon, Yellowstone, Yosemite, Arches, Capitol Reef, Grand Teton, Sequoia-Kings Canyon). We parked at the Grand Canyon Visitor Center Parking Lot next to Mather Point. We then walked along the Rim Trail to the Village, a 2.1 mile walk (3,4 km). Very good views of the Grand Canyon, the geology -with stones that are hundreds of millions of years old exhibited along the way. Lovely pine trees shading most of the way. There are restrooms at the Visitor Center, Village and Market Plaza. Take plenty of drinking water with you. Wear a hat and use sunblock in summer. A free shuttle bus runs between the Visitor Center and the Village, passing through Market Plaza. There is another one, running west along Hermit Road (we took it) all the way to Hermits Rest (food, restrooms available there). We walked around the Village and visited the main sights: Verkamp's Visitor Center, Hopi House (outside there were some natives performing traditional dances, worth seeing) and El Tovar Hotel. We then walk along the trail west to visit Lookout Studio and Kolb Studio and right there is the bus to Hermit's Rest. You can hop on and off the bus along the road. We took it to the end point and on the way back, walked a stretch of the rim from Hermits Rest to Pima Point (1 mi. - 1.6 km) where we took the shuttle bus back to our car. More information at the park's Official website. It is the only National Park in the U.S. to include and protect a section of Route 66. We visited the park driving westwards from Gallup to Kingman. So we only had a few hours but enjoyed it! we did the "half-day visit" described below. The Petroglyphs at Pueblo Puerco were unexpected. We also took some photos next to the rusting Studebaker. Blue Mesa was amazing! 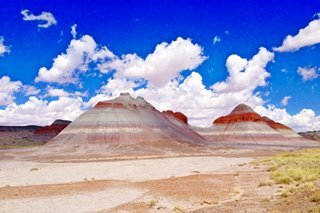 At least Walk the Painted Desert Rim Trail to Kachina Point, Drive Blue Mesa Road and Stop at Rainbow Forest Museum to see the stone tree trunks strewn on the ground. 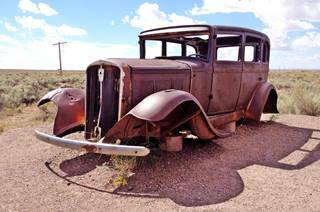 Drive the circuit and stop at the overlooks in the Painted Desert, include a stop at the Painted Desert Inn National Historic Landmark. Drive through the entire park. Stop at Painted Desert Inn Museum (in the Historic Landmark). Walk the trails at Painted Desert Rim and Crystal Forest. Stop at the Route 66, Newspaper Rock, Agate Bridge, and Jasper Forest overlooks. Visit Puerco Pueblo, walk the Puerco Pueblo Trail. Hike the Blue Mesa and ⁄or Agate House Trails. There is no overnight lodging in the park, camping in the park is limited to backpacking in the wilderness area and permits are required. 200 million years ago, during the Late Triassic Epoch this area was a lush rainforest with ferns and coniferous treees 10 ft. in diameter and 180 ft. tall. 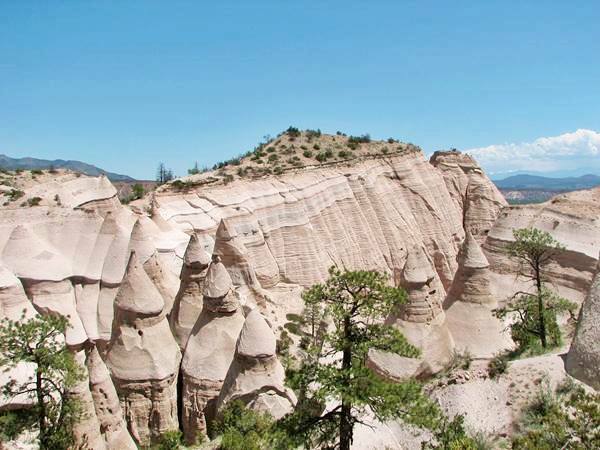 As they died or fell they were buried by sediments or covered with volcanic ash (known as the Chinle Formaiton) that preserved them before they decomposed. Ground water later dissolved silica in the volcanic ash and saturated the logs and crystallized, replacing what was once living tissue with quartz. This preserves the life-like appearance of the wood. Iron oxides give the petrified wood its red, organge and ochre hues. 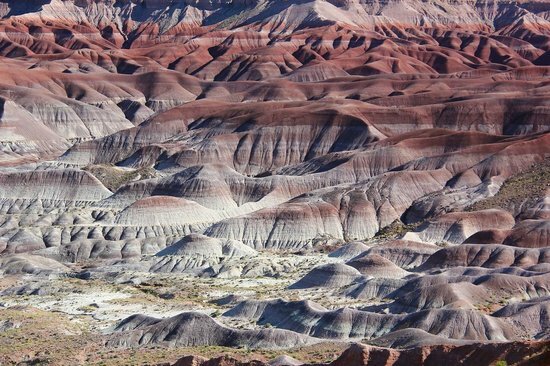 60 million years ago, the uplift of the Colorado Plateau led to the erosion of the younger rock that overlay the Chinle Formation, and this uncovered the logs and fossil plants. The park is one of the few in the world to have flora from the LateTriassic: cycads, ferns, ginkgoes, lycopods and more. 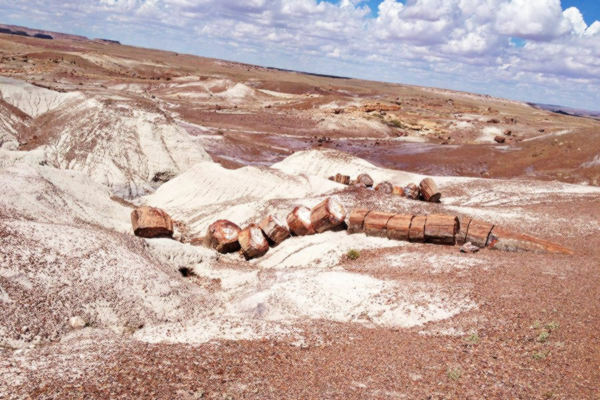 More details: Petrified Forest NPS Website. Petrified Forest N. P.Holbrook, AZ. A classic National Park lodge built in 1920 and restored to its original 1949 appearance. Now a museum. More details on this historic site at the Desert Inn NPS Website. 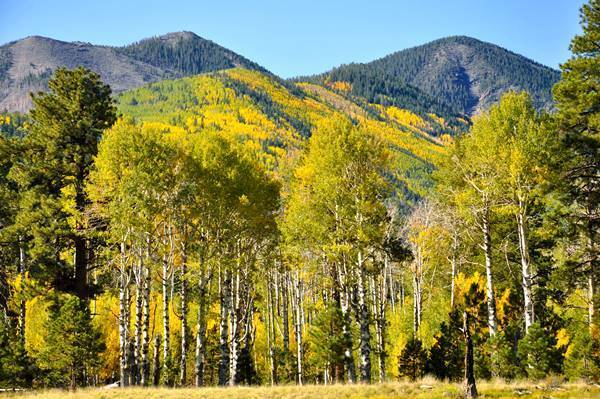 The hills and mountains that surround Flagstaff and extend towards the Grand Canyon are geologically young as they formed during the last 6 million years. They are now extinct volcanoes forming the San Francisco Volcanic Field. A hotspot below the Earth's mantle heated the magma which caused vast eruptions. As the American tectonic plate moved west, the volcanos spread eastwards. This created the highest mountain in Arizona (San Francisco Mountain) alt. 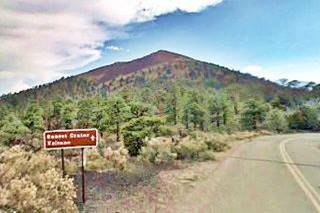 12,633 feet (3.853 m) and also the youngest volcano in Arizona, Sunset Crater which erupted some 900 years ago. Though quiet now, there will be more eruptions in the Volcanic Field, but when they will take place is not known. The volcanic field covers about 1,800 square miles (4.660 km2) is a great outdoors area. Most of it is lies within Coconino and Kaibab National Forests. It covers 1.856 million acres (751.000 ha.) and was created in 1898 as a forest reserve. It became a U.S. National Forest in 1908. 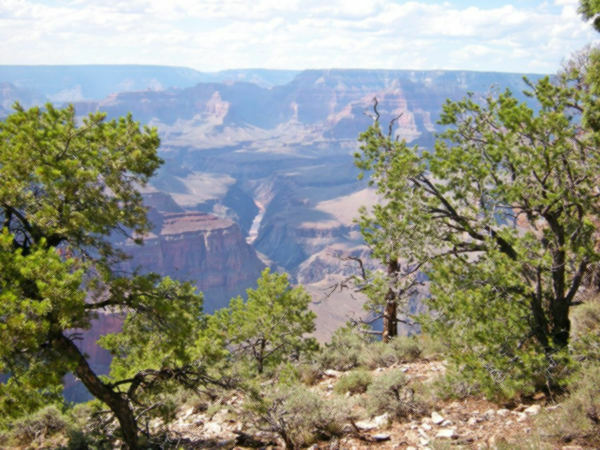 It borders with the Kaibab National Forest towards the Grand Canyon. Check the Official website for complete information. Fully paved. To and from Sedona along Oak Canyon Scenic Drive is a 59 mi. circuit. If you choose to include the Red Rock Scenic Byway, it is a 87.5 mile (2 hour driving time) round trip. The road was built in 1914 and paved in 1938; see the Map with Directions. Its name is due to a natural water slide in the slippery bed of Oak Creek. Slide Rock State Park is a state park of Arizona, USA, taking its name from a natural water slide formed by the slippery bed of Oak Creek. 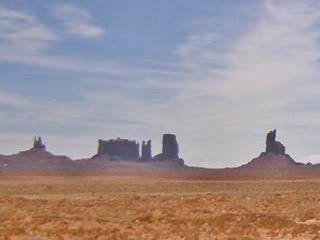 Several western movies have been shot here starring John Wayne, Alan Ladd, Charles Bronson and Jimmy Stewart. Admission fee charged. Visit the Official website for full details. Motels and Hotels in Sedona. 39 mi. from Flagstaff, just 9.4 mi. to the SW of Sedona, see the Map with directions. Go to the Official website for complete information. A 286 acre park, with hiking trails along the Oak Creek among meadows, red rock hills and juniper woods. The park has gift shop, picnic tables, visitors center and restrooms. Designated as Arizona's first "All-American Road". Ideal for a full day tour. Head south along SR 179. The red rock country has natural sculptures (Steam Boat Rock, Bell Rock, and more). When you reach the freeway I-17 (44 mi.) and head north, back to Flagstaff. It is 11.5 mi. southeast of Flagstaff (see this Map with Directions). Check the Official website for more info. Open daily except Christmas, it has several trails which allow you to spot wildlife and the remains of Native buildings that dot the canyon walls. It became a protected area as a Forest Reserve in the early 1900s, and was designated National Monument 100 years ago, in 1915. It is 44 miles northeast of Flagstaff along US 89 (Map with Directions). Open daily: 9 AM - 5 PM. The entrance fee covers both Wupatki and Sunset Crater National Monuments. Visit its The website. It preserves dozens of ancestral Puebloan villages of the Sinagua culture; the ruins dot the red sandstone cliffs. 21 mi. from Flagstaff via US 89 (Map with directions from Flagstaff to Sunset Crater). This is a very young (900 year old) volcano, that altered the forest around it with its cinder cone and lava flows. There is a trail you can hike and a viewpoint. More information at their Official website. Drive from Sunste Crater Nat. Mon. to Wupataki (1 hour 34 miles) along a scenic loop road through meadows, pine forests and the red sandstone. This is the map from Sunset Crater to Wupatki and back to Flagstaff, with driving directions. It is 172 miles norteast of Flagstaff, a 3 hour drive along US 89, 160 and 163, on the Utah state line. See this Map with Directions. More information at the Official website. This is a classic image of scores of Western movies. The rock pinnacles and buttes surrounded by red sand and shrubs in a valley of ochres and reds. An amazing experience. Wind and water have eroded the sandstone of the plateau for 50 million years. There are self guided tours and guided ones. Plus a visitors' center and Navajo crafts. The park covers 91,696 acres. 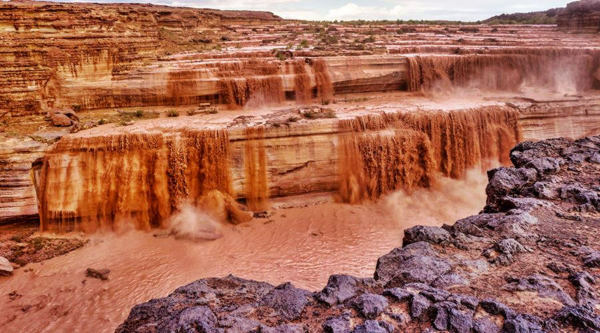 It has two viewpoints and includes the Grand Falls (mentioned above), Coalmine Mesa, Marble Canyon and East Rim of Grand Canyon areas. Visit the Official website. 18 miles north of Winslow along NM.87. There is a road that leads to the rim, and from an overlook you have great vistas of the coloured hills that are amazing. This is a Map with Directions from Winslow to the Little Painted Desert. see this Map with Directions. The falls are located inside the Navajo Reservation. March an April is the best time to visit the falls, which become a muddy water torrent falling 190 ft. (58 m). In summer it is mostly a trickle of water. The Little Colorado River is dry most of the time. It only carries water between March and April during the spring snow-melt period so that is the best time to visit the falls. A lava river flowed from Merriam Crater and spilled into the canyon of the Little Colorado River 150,000 years ago, it ran downstream for 15 miles and hardened. This dammed the river and caused it to deviate and fall over the Kaibab sandstone walls to reach the old canyon. Full details at the Official website of the Navajo Nation Parks & Recreation. 14 mi. from Kingman (Map and Directions). Forested mountain range that rises above the arid surroundings. It was home to the "pine tree people", the Hualapai natives. Hiking, biking. Picnic areas and skiing in winter. Read more at the Hualapai Mountain Park website. The Mojave National Preserve protects almost 1.6 million acres of desert habitat; it is a scenic National Park located just west of Needles, between I-40, I-15 and the California - Nevada state line. Observe Bighorn Sheep, visit the "Hole in the Wall" area, go along the "old Mojave Road" used by Indians and pioneers. 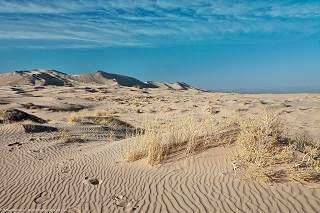 Visit the Cinder Cones, Cima Dome and Kelso Dunes. 12 mi. North of Needles, visit its Official BLM website. Topock Marsh was created by the backwater that flooded the lowlands north of Topock after the construction of Parker Dam. There are several boat launches with access to the Colorado River such as the Topock Marina in Arizona (exit 1, I-40 AZ) and Park Moabi (south of Needles). Topock Marsh is ideal for canoeing or kayaking. Reach the water at: North Dike, Five Mile Landing and Catfish Paradise. It is a great bird watching spot too. 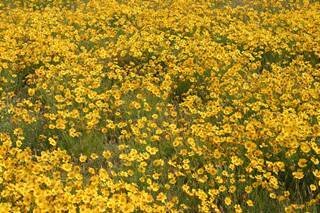 This is its: Official Havasu National Wildlife Refuge website. The very short course of Route 66 through Kansas does not have any Parks along it. However you can read about all the Kansas State Parks at the website of the Kansas Department of Wildlife Parks and Tourism. 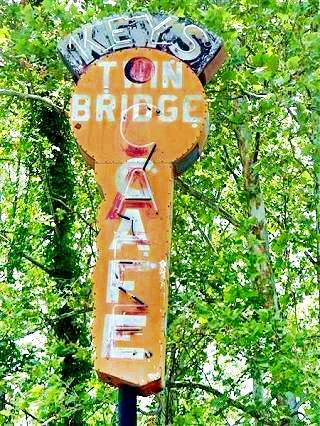 Located in Pittsburg, 32 miles north of Baxter Springs and Galena; you can reach it via US-400. Historic Missouri sites: Beach, Shelter and Observation Tower and Pump House. 8 miles west of Stanton (on ROUTE 66), this is a map with directions. Read more at the Park's Website (there is an RV campsite there too). Times Beach was a once bustling commnity but after being contaminated with dioxin in the 1970s, it was evacuated, demolished and decontaminated in the 1990s. Today it is the Route 66 State Park with its 1935 Steiny's Inn (Bridghead Inn), a 1932 section of the Mother Road and the now closed Historical Meramec River US 66 Bridge. There are several parks close to Grants in the Malpais area. The Spanish words "Mal" and "País" mean "Bad" and "Country" respectivley, hence: "Badlands", an appropriate name for the lava slag that covers most of the region. The badlands of El Malpais are protected as both a National Monument and a National Conservation Area. You can reach them through two different and separate routes: From Grants, south through San Rafael along NM-53 or, to the southeast, along NM-117. Between both roads lie the lava fields of the badlands. Below we describe the National Conservation Area along NM-117. 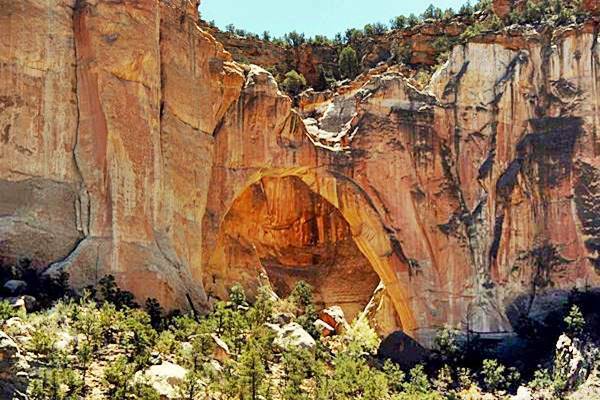 El Malpais National Conservation Area has the incredible La Ventana Natural Arch. The Official Website has fulll information. Created in 1987, the El Malpais National Conservation Area (NCA) protects the environment as well as cultural resources in the "Badlands" of Grants Lava Flows. There are many sights that include canyons, sandstone cliffs, the famous La Ventana Natural Arch (Ventana is "Window" in Spanish) and much more. The Zuni-Bandera Volcanic Field spans this part of New Mexico, and the Grants lava flow is the youngest flow in the field and one of the youngest in the 48 contiguous United States. The flow came from a volcano located 25 mi (40 km) south of Grants, and when it reached the San Jose River it turned eastwards for another 6 mi (10 km) down the valley. The lava has been dated to between 2m910 and 3,080 years ago. And this is interesting: there is an Indian legend about it! The Pueblo people tell about a river of fire in the San Jose River Valley, so they must have witnessed the outflow. The El Malpais National Monument is managed by the U.S. National Park Service. It is adjacent to the El Malpais National Conservation Area. Visit their Official website for more information. The El Malpais NPS Information Center is located on NM-53, 28 mi south of I-40. Passing the Information Center, on the south side of the road is the Bandera Crater and Ice Caves. Mt Taylor Ranger District, 1800 Lobo Canyon Rd. ; Grants, NM. (505) 2878833. Official Website. 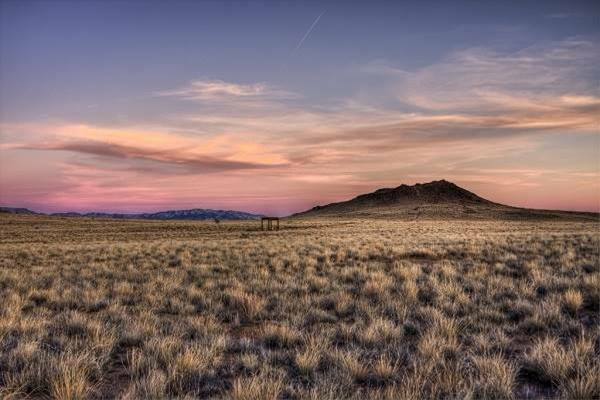 The Cibola National Forest and National Grasslands spans several locations covering 1.6 million acres in New Mexico, Texas, and Oklahoma and is close to Route 66 in Grants, Mount Taylor District, with two mountain ranges within it: to the north Mt. Taylor and to the south, the Zuni Mountains. They cover 520,000 acres of land. 25 mi. west of Grants. Read more at Bluewater Lake State Park. Ideal for fishing, hiking and watching wildlife. RV Campground. Visit the Official Website for full info. Its Inscription Rock, accessible along an easy trail has over 2,000 inscriptions carved in the sandstone. The name is Spanish and means "Bluff", "Headland". It is a great sandstone promontory which provides a shaded oasis for those travelling along the trails south of the Zuni Mountains. It was a camping spot and those explorers who passed by left their names dates or simply inscribed their symbols in the soft rocks, a memento of their visit: the Inscription Rock. 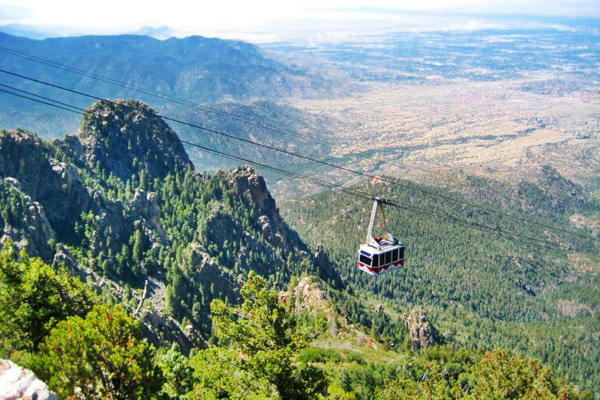 The areas nearest to Tijeras are the Sandia and the Mountainair Ranger Districts. The park is 46 miles southwest of Tijeras (Map with directions). See their Website. 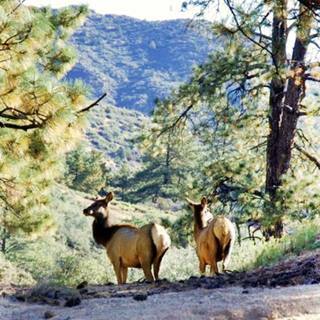 A great place for hiking, birding, wildlife viewing and camping in the forests at the foothills of the Manzanos. There is a campground and RV Park. The range gets its name from the Spanish word "Manzano" or "apple tree", due to the old apple orchards in the town of Manzano. Though ledgend has them planted by the Spanish missionaries in the 1600s, the trees date back to the 1800s, but nevertheless, they are perhaps the oldest apple trees in the U.S.
About 8 mi. northwest of Albuquerque. Access from Exit 154 of I-40, head north along Unser Blvd. for 3 mi. to Western Trail, gateway to the Nat. Monument. This volcanic area with the black volcanic rocks were sacred for the Pueblo people, who engraved their petroglyphs on them. The National Monument is a day-use park that closes at 5 PM. Take your time (average hiking time through the park is from 1⁄2 to 4 hours). Stop at the visitor center is (at Unser Blvd. NW and Western Trail) for current park information, maps and brochures. Open 8 AM - 5 PM. Boca Negra Canyon. See some 100 petroglyphs along a paved trail guided with signs. Paid parking, drinking fountain and restrooms. Rinconada Canyon. A 2.2 mile round trip trail (no water) with 300 petroglyphs; 1.5 to 2 hour trek. Piedras Marcadas Canyon. A 1.5 mile rount trip trail (no water) with 500 petroglyphs; 1.5 hours. The "Three Sisters" or Albuquerque volcanoes, and the West Mesa area formed simultaneously 150,000 years ago when the Earth's crust cracked and allowed magma to rise through it along a 5 mi. (8 km) fissure like a curtain of fire. The Rio Grande Valley is actually a "rift", where the Earth's crust is thinner allowing lava to flow upwards, the valley to sink and the lateral areas to rise, like the Sandia Mountains to the east. There are several trails from 0.8 to 2 miles long, from easy to moderately strenuous, which allow you to view the volcanoes by hiking around the cinder cones. Great views of the Rio Grande Valley and the Sandia Mountains. Take water with you. Parking lot is located at Atrisco Vista Blvd. NW (former Paseo del Volcan), about 4.8 miles north of I-40. (see Map and Street View). 41 miles SW of Santa Fe. Via I-25, exit 264 and NM 16 and 22. See Map and directions. Near the Cochiti Pueblo the place is amazing with rock formations known as Hoodoos, cone shaped rocks of volcanic origin that formed around 6 million years ago. There are trails that wind through canyons, climb to a mesa and give great vistas of the scenery. More information at our Pecos page. It covers almost 34,000 acres (13.630 km2) and preserves pueblo structures, petroglyphs and cliff dwellings dating back to the year 1,100 A.D.
Visit its Website. Ideal place for hikers with 70 miles of hiking trails. It was named after Swiss scientist Adolph Bandelier who studied the local cultures in the 1880s. During World War II, it housed the scientists who worked on the Manhattan Project to develop the atom bomb. There are bears and mountain lions in the park and you should try the Main Loop Trail which is 1.2 mi. (1.9 km) long and let's you visit some archaeological sites along the way. The Grand Lake O' The Cherokees has a surface area of 45,000 acres and boasts 1,300 miles of coastline. The park is known as the "Crappie Capital of the World" and is ideal for swimming, walking and enjoying water activities. Read more at the official website. It has several areas, accessible from Afton, Vinita and Miami. Close to Foss. From I-40 take Exit 53, head north along OK-44 for 7 miles and then head west for 0.25 mi. along OK-73. More information visit the Park's website. The Park is located on Foss lake and is the spot for hiking, riding, fishing, swimming and boating. There are RV campsites some of them full-hookups. It includes picnic areas, grills and restrooms. The Refuge HQ is located close to OK-33 20 miles north of Foss, (see the Map, location and directions). The Grassland is located 30 miles north of Sayre and covers about 30,000 acres of rolling hills, wetlands and prairies cut by serveral rivers and streams. Ideal for hicking, horseback riding, wildlife viewing. There are deer, turkey, geese, coyotes and bobcats. Three lakes are used for swimmng, fishing and watersports. Free admission. Read more: Park Website. Lodging in nearby Sayre, Cheyenne and Elk City. 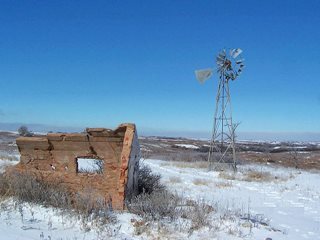 It was the home of the Comanche Indians who hunted and camped in the area. The area was a Cheyenne and Arapaho Reservation in 1867, and the following year Lt. Col. A. Custer attacked a Cheyenne village ("Battle of Washita") killing the chief Black Kettle (1803-1868) and more than 100 Native Americans. It was later opened to White settlers in 1892 and after the drought of the 1930s (Dust Bowl) it was bought back by the government for restoration and designated a national grassland in 1960. Take TX-136 north and reach Fritch (29 mi). The road continues to Sandford and Sanford Dam. Borger is 13 miles west of Fritch. The park is open all year round, 24 hours a day. Ideal spot for trekking, camping, horseback riding and of course, fishing, swimming and boating in the lake. It is named after A. A. Meredith, former Borger city manager who promoted the dam (Sandford dam) on Canadian River to provide drinking waters to eleven Panhandle towns. The dam was completed in 1965 and the lake covers 21,640 acres (8,760 hectares). Canadian River runs across the Panhandle and Oklahoma, to flow into the Arkansas River in eastern Oklahoma. Take TX-136 north towards Borger. After about 30 miles, turn left from TX 136 onto Cas Johnson Rd, after 3 mi. at the "Y" intersection go right and after 2 mi. Access Station. The quarries provided Native Americans with top quality flint stone for tools and weapons for over 13,000 years. 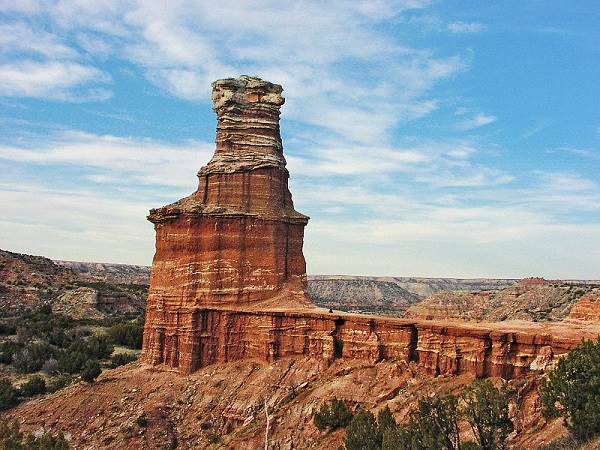 The Palo Duro Canyon State Park (27,173 acres) protects the second largest canyon system in the United States (after the Grand Canyon): it is 120 mi long and between 600 and 800 ft. deep; it formed over the last million years. Its name is a Spanish word meaning "hard wood", derived from the tough Rocky Mountain Juniper trees that still grow in the Canyon. At the Visitor Center you can buy books, jewelry, pottery and souvenirs. The Park has 30 mi. of trails for bikers, hikers and horseback riding. 32 miles SW of Amarillo. Take I-27 south and US 87 to Canyon, US 60 west to Umbarger and from there FM 168 S to the NWR. It began as a protected area around a lake formed by the 1938 Umbarger dam, and protects the best remaining short grass prairie in the U.S. of which 175 acres were designated a National Natural Landmark. The now temporary lake forms during major storms in the Tierra Blanca Creek basin, as the springs that fed it ran dry in the 1970s. I-17 to Tulia and TX 86 east up to Quitaque. Take a left onto Ranch Rd 1065/Geisler to the park. About 100 mi (160 km) SE of Amarillo, in Briscoe County. It protects the official Texas State Bison Herd.